About a month ago, I was happily reporting that Carter was gloriously sleeping through the night. Well, he has recently discovered his feet in the middle of the night and wakes up every morning at around 4 AM to use them as a drumstick on his mattress. It sounds like a car door is shutting over and over outside. He is never fussy or cries. He just wakes up and plays for about 2 hours sometimes off and on and then goes back to sleep. But guess who can't go back to sleep? We haven't been doing anything differently and I don't understand this sudden change in behavior. He also is clawing at his face and forehead in his sleep. He wakes up with a new scratch each day. We just have been telling everyone that he sleeps with a cactus! Where have the past 4 months gone?! You are now my big little boy. We took you to the doctor yesterday and you weighed in at 17.5 lbs. and are 25 in. long. You are definitely your father's son. You are alot more fun these days. Your little personality is shining through. You are reaching and grabbing for things now. You reached out and touched mommy's face as to say "I love you" and i just almost burst with happiness right then. You just laugh and smile all the time. You love looking at yourself in the mirror. You think your reflection is the funniest thing you've ever seen. You also really enjoy talking to other babies. You are just the most content baby and make lots of friends wherever you go. You love daddy and instantly light up when he walks in the room. The two of you just talk and laugh back and forth when daddy gets home from work. He likes to sing you rewritten crazy nursery rhymes. This makes me laugh, too. You also are very active. You always want sit up or stand on our laps; none of this reclining business. We got you a Jumperoo toy and a Bumbo. 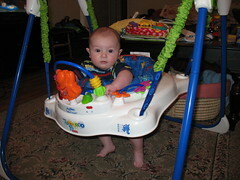 You love the Jumperoo. You sorta sway about like a drunken sailor in it. We all just laugh together. 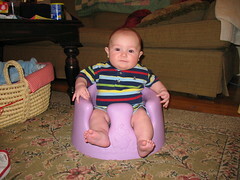 I'm not sure you are hot on the Bumbo yet. This is a seat that you fit snug into and it helps you to sit up with support. Anyway, you are growing up into a special, healthy little guy and daddy and I love every minute we get to spend with you. You are the most amazing thing that has ever come into our lives and I can't wait to teach you so many things. But most of all, I can't wait to tell you how much I love you. Four months ago tonight I sat, quietly, in a hospital room at Hendrick Medical Center. Cilla was in labor, and, thanks to medicine she was sleeping peacefully. Unaware of each contraction. We've both written about the milestones Carter is making these last four months. Why stop now? Carter is still a big, beautiful boy. He went to the doctor yesterday. We think he has allergies. The doctor thinks he has a cold. We found out, without much surprise, that he really is a big boy. He weighs 17.5 pounds. His cousins were all really big, too. Cilla and I like it that way, big and healthy. Carter usually sleeps through the night. He'll wake up when his nose is so stopped up he can't breathe through his nose. He eats well. He's learning to pull objects to his mouth, learning to grab, and learning to laugh. Cilla is still a wonderful mother (who would expect any less). She gentle and patient with Carter. She's gentle and patient with me. I love her very much. There is no one else I'd choose to raise my son.